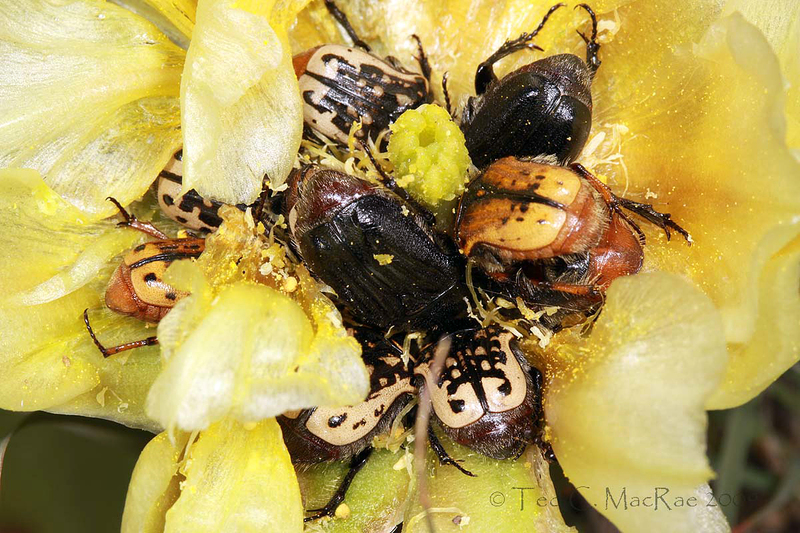 So I don’t get accused of asking but not giving, I leave you with this photograph of a group of Kern’s flower scarabs (Euphoria kernii, family Scarabaeidae) congregated in the flower of large-root prickly pear cactus (Opuntia macrorhiza, family Cactaceae). Photographed this past June at Four Canyon Preserve in northwestern Oklahoma, this common, extremely variable species (ranging from all black to black and white to black and yellow to nearly all yellow) can be found throughout the southern Great Plains, where it congregates tightly in flowers of Opuntia , pricklypoppy (Argemone spp., family Papaveraceae), thistle (Cirsium spp., family Asteraceae), and yucca (Yucca spp., family Liliaceae). Photo details: Canon 100mm f/2.4 macro lens on Canon 50D (manual mode), ISO-100, 1/250 sec, f/16, diffused MT-24EX flash. This entry was posted in Coleoptera, Scarabaeidae and tagged beetles, blogging, entomology, insects, nature, Oklahoma, scarabs, science. Bookmark the permalink. I nominated “A Silver Anniversary”. I love those pictures and remember collecting all 3 species and having you identify them for me! I would have liked to see those Euphoria in the cactus flower – I would not have let any of them live! Thank you, Paul! They are spectacular beetles, indeed. Just nominated Trees of Lake Tahoe series. Hope you get it- good luck! Thanks, Alex!. I haven’t found many “field accounts” among the submissions – maybe the judges will be in the mood for something different. Your support is appreciated. I had to go with “A Silver Anniversary” because… Well, let’s just say I’m doggone impressed! I’ve only been reading your blog for the past several months after finding you through CoTS, so I had no idea you were, like, a totally famous and, like, great discoverer and stuff. I really like the scarabs! Variable? That’s looks like an understatement. Thanks, Jason – I think that is my personal favorite as well. As my first new species description, I played it pretty safe with P. paraxillaris (although I felt inside like the last name you suggested :)). Anyway, your support is greatly appreciated. You’ve got to be kidding. I think you’re the only scientist whose writing is actually interesting, Ted. You look at the whole picture, not just the insects. You see the world as an ecologist, and as you know, many others in your field don’t. I’m submitting a bunch of your writing. I think your whole blog needs to be submitted. Oh Allison, you’re so sweet! My ecologist perspective is relatively new – thanks in large part to you. Thank you for being such a loyal reader! Here in the western cross timbers, one of the earliest things to bloom in quantity is the Opuntia. The blooms are always crowded with beetles and others. Great photo and thanks for sharing. Keep up the great writing. It’s my favorite blog although I very rarely have time to stop and comment. Hi Troy. You should check the Opuntia in your area in spring for Acmaeodera buprestids – I’m wondering if A. ornatoides (similar to the more broadly distributred A. ornata) occurs in your area, as well as some of the smaller species related to A. tubulus (e.g., A. neoneglecta, A. conoidea, etc.). Thank you for your high praise – I hope I can continue to be deserving of it. I’m a new follower of the blog — and have enjoyed digging through the archives. I nominated “A Silver Anniversary” also – for the great description of the process of science/identifying a new critter as much as the nature writing. Thank you, Michael. I’m pleased you’ve found my writings enjoyable. Wow! I nominated “A Silver Anniversary” as well. It is one of your many posts that reveal your passion for what you do and the exciting and systematic process of discovery.